When her son Jackson entered third grade, Diana Zevala noticed a changed in his attitude toward school. He grew less interested in school and started to not want to go. Diana, a former English teacher at Progress High School in Brooklyn, New York, sensed he was under stress. Following last year’s winter break, she discovered the cause. Over the break, a local yoga studio had burned down. She went to Jackson’s teachers to ask them to get other students involved in relief efforts. The teachers said they didn’t have time and showed Diana a full calendar of testing days. With standardized tests slated for October, November, December, April and June, teachers had no time for activities beyond test preparation, she said. “Kids are not being allowed to grow naturally and their natural instincts are not being nurtured. They are being drilled and trained to figure out multiple-choice questions. That is not real thinking and there is no self-expression” Zevala says. In New York, schools are part of Race to the Top, a program put forward by Arnie Duncan, the former CEO of Chicago schools and currently President Obama’s Secretary of Education. In return for evaluating teachers according to their students’ performance on standardized tests, among other measures, Race to the Top schools can get more money from the government. Furthermore, underperformance on the tests can become a reason to close a school, which in turn may be replaced with a charter school. “It’s the carrot and then the stick,” Zevala says. Frustrated by the increasing bureaucratization of her local public school system, Zavala was eager to see another model at work. So she signed up for a volunteer brigade to El Salvador. For two weeks, she and thirty other volunteers worked in conjunction with the Salvadoran Ministry of Education on its goal to teach everyone to read and write. “Because I was seeing what was happening here in New York, I felt that I wanted to see something that was inspiring and different,” she says. In communities across El Salvador, which is in many ways still recovering from a brutal twelve-year civil war (1980-1992), the Ministry of Education is organizing neighborhood literacy circles, small groups of adults who attend class every afternoon for a period of six to eight months. Over 135,000 Salvadorans, predominantly older women, have graduated from the program in just two years, thanks to the participation of over 7,000 high-school and college students who have volunteered as teachers. 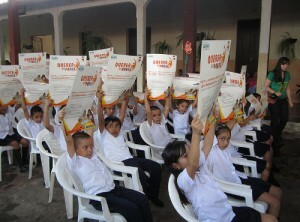 Though El Salvador’s national budget for education is dwarfed by that of United States, the investment in public education has been steadily increasing with the 2009 presidential victory of the leftist party, the Farabundo Martí National Liberation Front (FMLN), which during the civil war fought against a repressive, US-backed government. With FMLN leaders at the helm of several key cabinets, including health and education, and a slight legislative advantage over the right-wing parties, social investment has increased significantly across the board. As part of a national education reform, the government has raised teachers’ salaries; in 2011-2012, over $59 million was spent on raises, with bonuses for the over 40,000 public school teachers in the country. To increase access to free public education, which is guaranteed by the Salvadoran Constitution, the government now provides school uniforms, shoes, and school supplies to nearly 1.4 million children whose family cannot afford them. “Before, the students went to school barefoot and in rags. Now, they stay in school. This isn’t a populist idea. The school packets have generated 50,000 jobs, both directly and indirectly,” reported Héctor Samour, El Salvador’s Vice-Minister of Education, during a June 2012 press conference. The scholastic packets, as well as a daily meals at school for over 1.3 million kids, has likely helped El Salvador reach 93% coverage for basic education in the country, with enrollment and graduation rates expected to increase. Rising investment in public services in El Salvador is a result of a decade of mounting struggle against privatization and other neoliberal economic policies implemented by the right-wing Nationalist Republican Alliance (ARENA) party, which ruled El Salvador for 20 years before the election of President Mauricio Funes. Following their first presidential victory in 1989, ARENA loyally followed the recommendations of the International Monetary Fund and other international financial institutions, becoming a poster child for a grand experiment to enhance private wealth at the expense of the public sector. As the global push toward privatization-as-debt-solution for heavily-indebted countries across Latin America and elsewhere sped up in the 1990s, public budgets were slashed. Public sector workers were made to do more with less. Access to services was limited; by 2006, for example, over 47% of Salvadorans had no access to health care, despite a constitutional guarantee to receive care. Successive ARENA administrations pushed for complete privatization and got it in many sectors, including electrical distribution, telecommunications and banking. As a result, consumer costs skyrocketed – electrical rates rose 47.2% for most families after the distribution system was privatized in 1996 – alongside unemployment levels. The privatization mandate from El Salvador’s lenders and “development partners” continues today. Despite the concrete benefits of the literacy program and other social services in El Salvador – created by investing in public sector workers and programs – the US State Department is currently promoting private, foreign investment in El Salvador’s remaining public industries and services. Under a bilateral development agreement, the Partnership for Growth, the US State Department is heavily pushing “Public-Private Partnerships” in El Salvador, most recently threatening to withhold the Millennium Challenge Corporation’s second round of development aid funding for El Salvador unless the new Partnerships are permitted. The Salvadoran Legislative Assembly is now considering a proposed Law of Public-Private Partnerships, which would create a mechanism to offer 40-year concessions to private investors for institutions and services currently administered by the government. The first sector at risk is airports and seaports; after that, labor union activists warn, municipal water systems and prisons could be put up for auction, as well as schools and healthcare. “The Public-Private Partnership is nothing more than privatization by another name, and we have lived the experience of privatization in El Salvador,” says Manuel Mira. “When they privatized the telecommunications sector and Social Security pensions, for example, what happened? The workers were left in worse conditions.” Wages fell and work hours increased, he reports. Xian Barrett, the recording secretary of the Caucus of Rank-and-File Educators (CORE) within the Chicago Teacher’s Union, echoes Mira’s concerns. “In many arenas, you see the ruling class of our country – the ruling class of the world by association – seeing opportunities to make lots of money while experimenting on the poor and minorities of our country,” says Barrett. The successes of the Chicago strike, which include winning a pay increase, defeating Mayor Emanuel’s proposal for merit-based teacher pay and bringing national attention to the education policy prescriptions being promoted from the highest level of the Obama administration, mirrors tactics that have been implemented successfully in El Salvador.. After several devastating sales of public industries to private corporations, including telecommunications, Salvadoran social movements, led strongly by public sector unions, was able to channel widespread consumer outrage at skyrocketing costs and unemployment levels into organized resistance. A massive, eleven-month strike by nurses, doctors, janitors, lab technicians, residents and others ultimately defeated an attempt to privatize the social security medical system in 2003. Mass protest – with communities and public sector unions joining together – similarly defeated ARENA’s attempt to privatize the public water system in 2007, despite privatization being a condition of an earlier IMF loan. Examples of successful, organized resistance to privatization inspire not only teachers and union members in the US like Barrett, but also parents like Diana Zavala, who has seen for herself in El Salvador that the momentum built can even reverse the trend of slashing educations budgets. Allen Hines is a researcher with the Committee in Solidarity with the People of El Salvador. Please join us in welcoming William Hernandez, LGBTQ rights activist and Executive Director of the Salvadoran non-profit Asociación Entre Amigos to Portland on Wednesday, November 3rd for an evening of education, discussion and making connections to organizations doing similar work locally. This event is FREE and open to the public.